Noodles, carrots, green pepper,onions,tomatoes, pepper, vegetable oil, meat,plantain and raw eggs. Cut carrot,green pepper, onions, tomatoes and pepper. Boil noodles wen almost done pour d vegetables, let it boil for 2mins. sieve water and pour in a bowl,add the noodles seasoning, break raw egg in it and leave for some minutes. Put little quantity of oil in a non- stick frying pan,once it's hot pour the noodles. 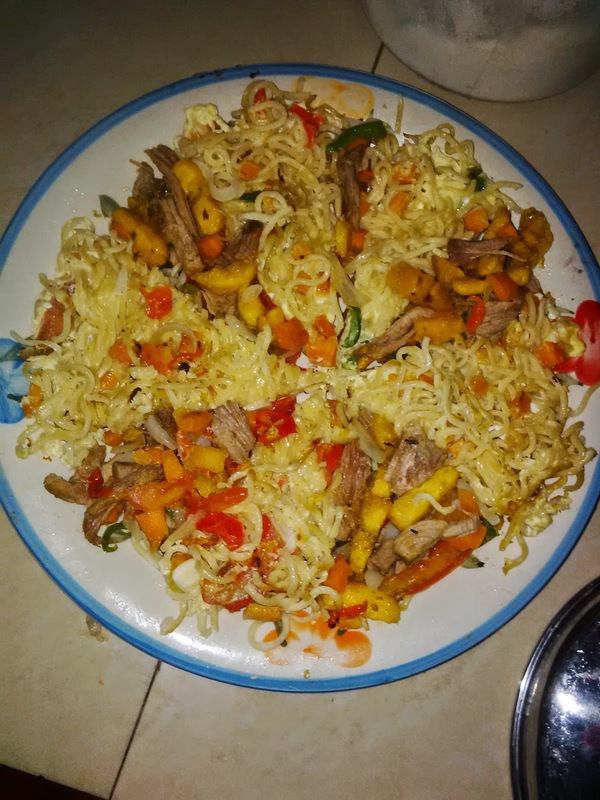 N.B: if the noodles is too much it won't stick together so u can fry it twice , turn the other side to fry as well put in a flat plate..cut into shape like a pizza...I made a sauce to fill some gaps of the noodles by removing some potions of the noodles.... for the sauce dice plantain into small pieces, beef into small pieces as well, cut tomatoes, red pepper, onions, carrot and green pepper... put very little oil into a frying pan already on fire ‎pour all the ingredients into d oil and stir, add a little pinch of salt and Maggi to taste..stir fry about 2 mins....put sauce in part of your pizza noodles.